no deposit deals, free slots spins, generous deposit bonuses and exclusive offers. Start by clicking ‘Claim Now’ on your chosen offer to get playing, or for more info and simple step-by-step guides hit ‘How to Claim’. T&Cs apply to each of the offers below. Tap the ‘T&Cs’ link on individual brands for full terms. 18+. New players only. No deposit required. Bonus awarded as bonus credit & cannot be withdrawn. Max withdrawal without depositing is £200. You can withdraw any unspent deposit, in addition to the funds in your cashable credit account. T&Cs apply, BeGambleAware.org. 18+ New players. Dep min £10 & code for bonuses +15 Spins [FS]. One 1st Dep Bonus p/player. FS for 7 days , FS wins in games bonus after FS used & cap at £4. Bonus wins cap @ £100, exc. jp win. Wag reqs apply. Dep w/drawn any time. Further T&Cs apply. 18+ First time depositors only. Min deposit: £10. Max offer: Bingo Tickets worth £100 (£50 on Street Party & £50 on Big Bang) plus 10 FS on a game of our choice with winnings capped at £0.50. All winnings will be credited to your real money balance. FS expire after 7 days. Promo code: IDOL. Full T&C’s apply. Valid until 31.12.19. 18+ First deposit only. Free Spins on Fluffy Favourites valid for 7 days and win capped at £5. Bingo tickets: 5x BIG BANG, 40x KACHING, & 10x Guest List. Deposit balance is available for withdrawal at any time. General Terms and withdrawal restrictions, and full terms apply. 18+ New players. Code BINGO. £20 Bingo Bonus for 1st dep of £10. Bingo tickets only. 3 day exp. 4x wager. Bonus not withdrawable. £10 min dep + 2.5% fee (min 50p). Not avail. using Neteller / Skrill. Withdraw cash bal. anytime, £2.50 fee. T&Cs app. 18+ New Customer Offer Only. 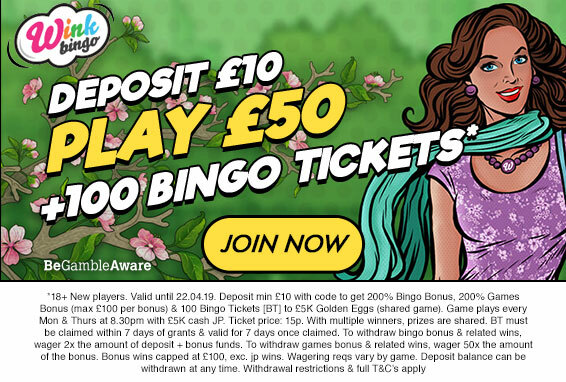 Deposit and play £5 on Bingo games within 30 days of joining Betfair Bingo. Get £25 paid as Side games bonus (x20 wagering requirement) and £15 as bingo bonus (x5 wagering requirement). Staking requirements & eligibility restrictions apply. £10 must be spent on Bingo tickets. £40 Bingo Bonus - x2 wager requirement. £20 Slot Bonus - x20 wager req. 30-day expiry period applies to both bonuses. 18+ Further T&Cs apply.